The above-mentioned police murders have all occurred in the last six months. They are not isolated incidents. Police brutality is an epidemic in a society where poor people and people of color are criminalized. Each of these police killings were instances of extreme brutality carried out against people who had committed no crime. Andy Lopez was a middle school student going to play with friends. James Boyd was a homeless man trying to survive in a world where services are being cut. Alejandro Nieto was a student and worker eating dinner in a neighborhood park. WORD (Women Organized to Resist and Defend) has joined in rallies and protests to demand justice for the victims of police brutality. We have joined in actions against racist stop-and-frisk policies like those implemented in New York City. 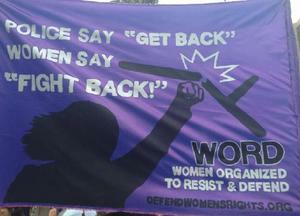 We are an organization fighting for full rights for all women. This includes the right to live in communities free of the fear of police repression. Our family members and ourselves have a right to live without the fear of being beaten or shot by armed cops merely for being Black or Latino or for being a poor person trying to survive. WORD joins with communities across the United States in demanding that killer cops be jailed, that independent investigations take place in all cases of police brutality and that racist stop-and-frisk policies be ended immediately. The epidemic of police brutality is coupled with increased attacks on social services like public transportation, education and funds for people’s needs. Women—and particularly women from communities of color—suffer the effects of impoverishment at extremely high rates. Our communities need jobs, education, health care and housing, not racist brutality and repression.